When the sun reaches the Tropic of Cancer in June, the Northern hemisphere enjoys the longest day of the year. For thousands of years, this has given people in northern lands a good reason to celebrate. In the cycle of the year, the days marking the winter and summer solstice have long played a special role and have been celebrated with festivals and rituals. Christianity upheld ancient customs and assigned to them the two holy birthdays of Jesus and John. Since then, people have celebrated St. John’s Eve on June 24th. This date is celebrated in its own special way in different countries. Midsummer bonfires are set at night in many parts of Germany and Austria, often in places such as mountain peaks that are visible from far away. In the past, girls would wear wreaths on their head made from St. John’s Wort or Hypericum. Around this time, the plant’s blossoms and its power is at its strongest. Another custom was to place a twig of this medicinal plant under one’s pillow to make wishes come true. Since time immemorial, people have revered the healing power of the sun and its life-giving energy. 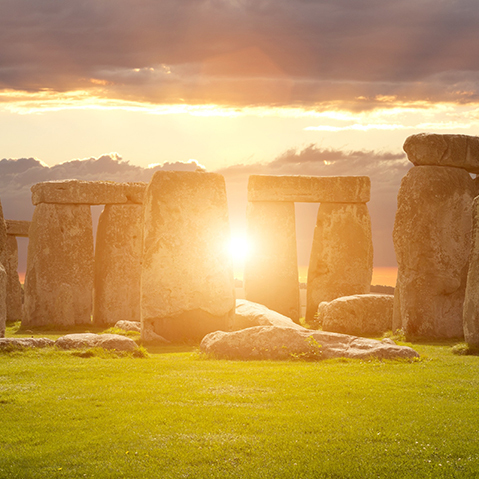 Prehistoric buildings were built in alignment with the sun’s position on the day of the solstice. One such example is Stonehenge in England, where the sun shines through a corridor into its interior on the morning of midsummer day. Today thousands of people gather to celebrate the shortest night of the year at Stonehenge and watch the sunrise, framed by this monumental stone structure. The Noche de San Juan in Spain is a marvellous experience, especially along the coastline. Blazing bonfires are lit on the beaches, and some people leap over them or toss in notes scribbled with their wishes. At midnight, fireworks light up the sky and many people go for a nocturnal dip in the sea, which is said to bring good fortune for the coming year. When it’s summer in the northern hemisphere, it’s winter in the southern hemisphere. In the Inca capital of Cusco in Peru, the Inti Raymi – the “feast of the sun” – takes place on the winter solstice. From the middle of the last century, thousands of spectators gather here every year on June 24th to watch theatrical performances on the Inca walls of Sacsayhuaman. In northern Europe, where the “white nights” invite people to celebrate all night long, one of the most popular festivals is St. John’s Day. On Sankt Hans, bonfires flicker along the coast of Denmark. The Danes also celebrate the midnight sun with processions of torches and lanterns. Almost every festival held on this day takes place at the waterside – on the beaches of the North Sea and Baltic Sea, along fjords and bays. Ivan Kupala is the feast of fire and water, celebrated in Russia and Ukraine in the beginning of July. The day connects the Christian saint John – known as Ivan in Russian – with Kupala, the old Slavic god of the fruits of the earth. To celebrate, people go swimming at night or set out flower boats or candles on the water. It is said that on this night, the plants will blossom with magical powers; so, too, the fern. Whoever discovers a blossoming fern in the forest is said to be blessed with happiness forever after. Bonfires burn brightly at the sea and the lakes, as the shortest night in Finland is celebrated with grand festivals and small private parties. The sauna is stoked and two small birch trees often stand next to the entrance door as a welcome greeting to guests. For many Finns, Juhannus marks the start of their summer holidays. In Latvia, Jāņi is the most important festival of the year and is celebrated over several days. Almost everyone wears a wreath: women and girls wear them made of flowers, while the men wear wreaths made of oak leaves. There is a great deal of singing and the short night is spent by the fire. The saying goes that those who sleep that night will be tired for the entire year to come. Sweden resisted a Christian reinterpretation of its midsummer festival, and John did not become its patron saint. Midsommar is the second biggest festival of the year. People dance around a midsummer pole, simply celebrating the summer season.